Did I ever tell you that I received this in the mail? Hmmmm. I started him on Christmas Day and have made steady progress on him. I see his nose needs a little adjusting and is not as round as Janet Zickler Casey's Santa.She has quite the collection of Santas on her website. Yes, I have quite a few. If I can, I hope to order the Nutcracker Santa and hopefully next year SNS will offer the new one she is teaching at ANG called Uncle Sam Santa. Her Liberty Train looks awesome too! I have one sick child at my house with the flu. Yuck! The college boys came home and shared something nasty. Most of us are up and doing, but it has gone through the house twice! I think I will be getting the bleach water out and cleaning today! Anyway, Happy New Year blogger friends! 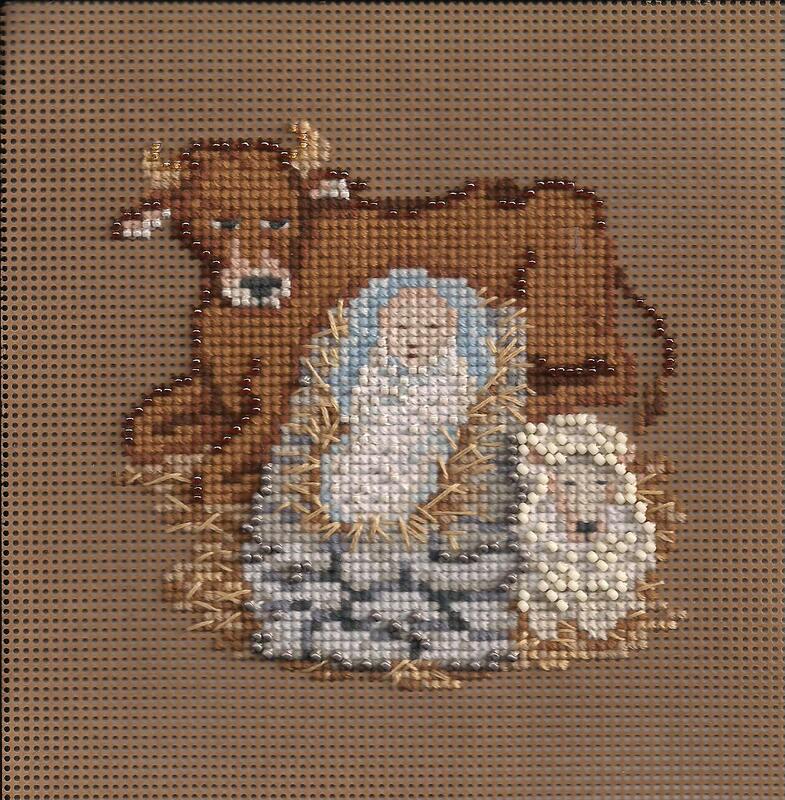 I hope to post my stitching plans for 2018 tomorrow. This is for the 2017 Small SAL. May you have a blessed Christmas celebrating the birth of the King of kings. 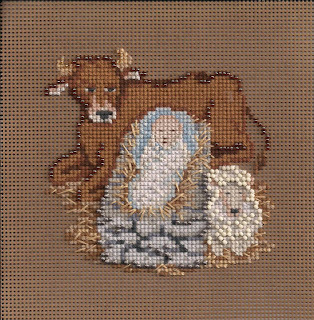 I have caught the cold the boys brought back from college and I don't feel like stitching. But a wonderful friend sent me this lovely ornament. It is smocked and I don't do smocking so I especially love it. Thank you friend! Anyway, Janet is in Houston and her home was flooded. Threads were back-ordered and my Santa has not arrived. I am not complaining! I totally understand and am just glad she is ok and feel sorry that she has to be dealing with the aftermaths of a hurricane. 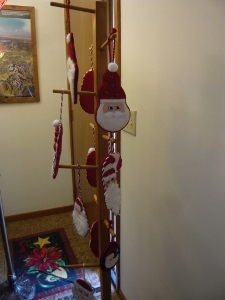 I almost went to the basement and started a different Santa, but refrained. I decided I am close to finishing the series and need to get myself in gear so I can hang these next Christmas! Now, if you made it to the bottom of this post, I have an announcement! I am close to making 1000 posts on my blog. That is mind boggling! And it has been 10 years since I started blogging! Wow! So I am going to host a give-a-way. I am gathering some of my favorite things and I will be sharing them with you. I will make an announcement as I get closer to the give-a-way date.Stay tuned! First, thank you for your kind words. 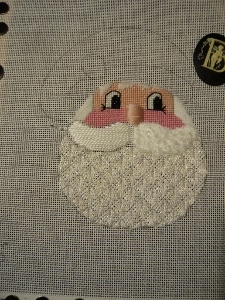 Once I FIND the Christmas Tree Santa, I will ttry to get him finished to show you. I normally work around my mistakes, but I knew this one would be a headache quickly. I was able to do a lot of stitching Friday and Saturday night. One side of the sky done! Well, except for some stars. I am thinking about doing a rotation of projects this year. I have a few big projects that I need to power through. What are you doing for 2018? First, I want to say, I am not a finisher. I really don't like to do it. I love the process of stitching, but finishing a project into something has never interested me. 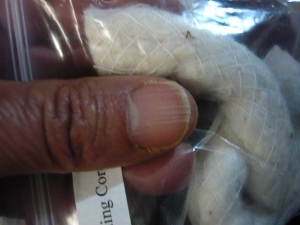 I like the feel of fibers in my fingers. I like watching patterns develop. I like how it calms me when I stitch and allows me to relax. Finishing makes me tense and want to throw everything against the wall. So why did I finish these myself? One reason is that it is almost Christmas. If I want these to decorate my house this year, I needed to finish them myself. The other is cost. My finisher is worth every penny she charges, but I just don't want to pay to have something finished that I can do an ok job on. 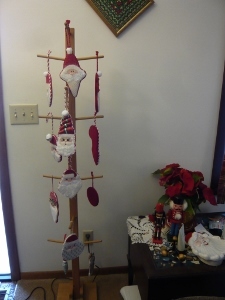 And two photos of the hat rack where they all hang. 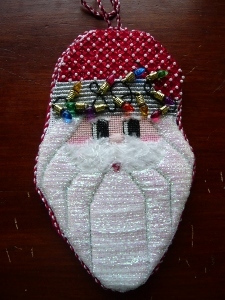 I have a missing stitched Santa in my house-Christmas Tree Santa- and one coming in the mail soon- Pine cone Santa. There are several Santas that I haven't even started yet in my basement! I need to find another way to display them-SOON! These little ornaments are taking forever! I don't work on it every night, but I try to spend a few minutes on it every week. I may just pull it out of the bedroom, where I stitch on it, and work on it during the day. I know that this is a huge task, so I always try to outline as I go. I am almost to the stable! 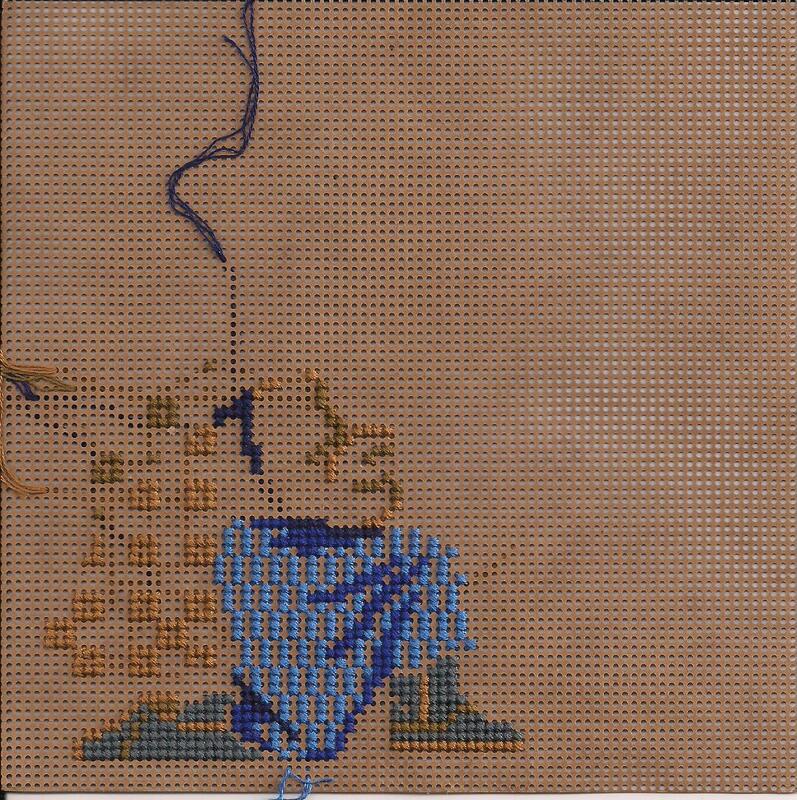 I have no urge to pull out Gay Ann's Drawn Thread Sampler. I need to. I ought to. 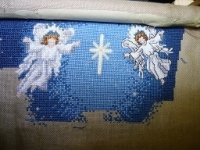 But I think I will wait until January and see how much progress I can make on my Christmas stitching. Not much, to be honest. I spent more time making candy than stitching. But I am almost done with my candy making so I can concentrate on stitching! That is until those college boys come home and want to be fed! 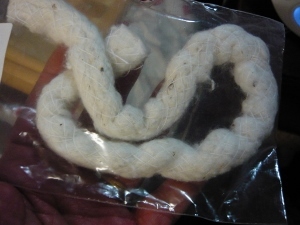 First, this is the cording I used for the Santa hat. It is round and about as thick as my thumb. Hope that helps! This is where I am on Gaspar. 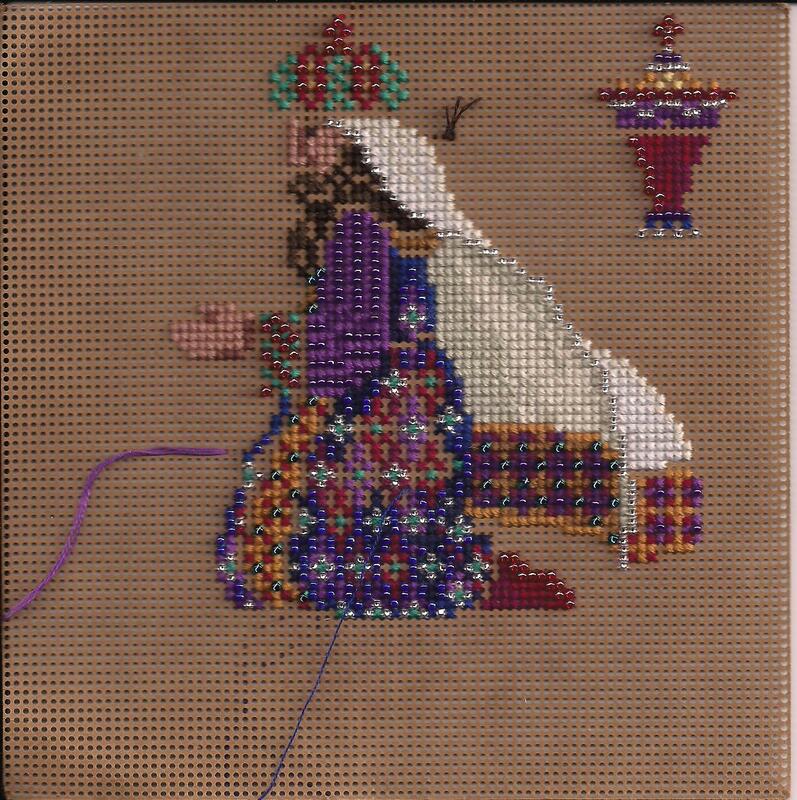 He won't be done for Christmas, but I am making progress. Well, it took me longer to decide to stitch this than to actually stitch it! It was hard to stitch the ribbon on the padding. Hopefully I can get it finished next week so I can hang it on my tree. 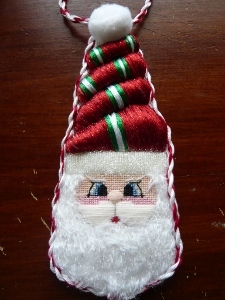 It is Candy Swirl Santa by Janet Zickler Casey. My son started it, probably around 2006/7. He did great on the face and the beard, but the hat was too much for him. He was around 11 at the time. I have been wanting to stitch it and get it on my Santa tree, but I didn't know what to do about my son's stitching on the hat. So I asked on Needlepoint Nation on Facebook! They thought I should leave it, so I did. It is a pain to get smooth, but I am loving it. Will I get it done before the next Janet Zickler Casey Santa arrives? I finished this Thursday, but am finally posting. I need to get it packaged with some candy to send to my mom. Can I put it in Gifted Gorgeousness too? 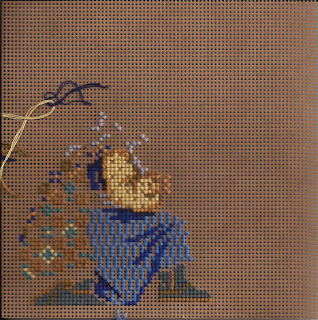 Linda, it is actually fairly easy to stitch and lots of fun. I decided I needed to work on my Christmas stocking. The rest of my family has stitched stockings, but I do not. I will not again this year, but I am stitching on it a bit. Do you think if I cleaned my mess, I would get more stitching done?